Nora and Fern's relationship as mother and daughter is a tumble of love and distrust. To Nora, her daughter is an enigma -- at the same time wonderful and unfindable. Fern sees her mother as treacherous -- for busting up their family to move in with her lover, Jeanne. As their lives become complicated by the arrivals of a skateboarding boyfriend for Fern, a shadowy affair for Nora, a baby in need of a family, and by the failing health of Lucky, their beloved dog, this mother and daughter find their way onto a fresh footing with each other. 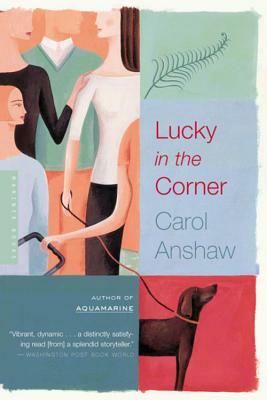 "With sharp humor and perception" (O: The Oprah Magazine), Lucky in the Corner shows us the way a family reconfigures itself as unexpected changes come its way -- and how, no matter what shape it takes, it remains a family. Carol Anshaw is the author of Aquamarine and Seven Moves, both Lambda Award finalists. She has won the Carl Sandburg Award, the Society of Midland Authors Award, and a creative writing fellowship from the National Endowment for the Arts. A recipient of the National Book Critics Circle Citation for Excellence in Reviewing, she reviews books for major newspapers nationwide.